Very nice place. I had the burger special when I was there and it was an above average burger. We shared a few appetizers and they were also good. We did like the 'normal' beer selection, but there's more available in bottles. Go for the bottles. 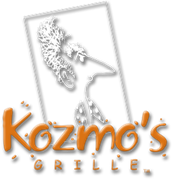 I have come to Kozmo's on a few occasions. Each time I have come to Kozmo's it gets better and better, as I learn of each menu item. My most recent visit which was on 08/21/14, was very memorable, and enjoyable. We had Melinda as our server, she was fantastic. She was quick, accurate, and friendly. Not to mention that my strip steak was perfect, with the baked potato. The chef(s) really did a great job as well. We went there for dinner while passing through on a road trip and the food was so good! I got the Home-made Kozmo Chip Baskets and I would recommend them to everyone! It was delicious. And if you like fish you have to try the Scrod, it was so good I wanted to order a second plate to go. The waitress was awesome, always making sure we did not need anything and I will be back for more! Great atmosphere, typically quiet, and always good service. The food is great, authentic brick oven pizzas and the seafood is very good! Love the atmosphere, it is a nice quiet restaurant. It is a great fancier place to go where you don't have to fight the crowds in Canton. Their pizzas are really good and the service has always been professional. Wow!!! It takes a lot for me to say that...Kozmos delivered wow-worty food from unique and tasty apps, to the best restaurant bread I have ever had, to fin and tasty pizza---all in a clean and cool environment! Service is a little slow, but obce you start enjoying the food you want to take your time.